And as my granny would say, "I wish you luck to wear them and tear them to bits!" Oh, little girls and grandmas and shoes. Sigh. Love her tights, too! New shoes in general, those in particular--wonderful! Hey, we have those shoes too! (The ones she has on.) Very cute. My girls love shoe shopping. Mmm...new shoes!! More than one pair!! Lucky duck! While the new shoes are pretty sweet, I have to say that I love the old shoes. They have so much character. Much fun was had in those shoes, and they show it. And I generally have a weekness for Mary Janes. I am dying over those socks and shoes! Do you think they'd look nice on my boys? New shoes and a dress that poofs when you spin, what more does a girly girl need? Oh how I love the little girl shoes! As Alejna said, I love the worn shoes. 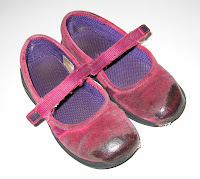 I was so attached to the first pair of shoes my daughter actually wore and wore out, because of all the character in them. do you think the pink sneaks come in a women's size 9? Yes, they do, the real question is, would they look anywhere near as cute, and I know, sadly, the answer is, nope. Cute shoes, and love the tights! I start shoe shopping three months in advance of need. 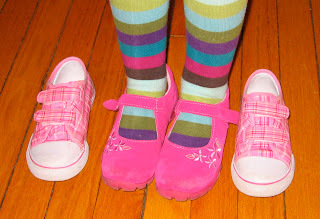 It takes that long to find shoes my kids will wear they are SO picky! Grandmas are always good for new shoes. Gotta love a Grandma. I want those sneakers. I'm serious. Pink goes with everything, doesn't it? I would like those little pink Mary Janes, please. For moiself. Oh, the shoes are making me want to have a girl. Girl shoes are soooo much better than boy shoes. She is totally rocking those shoes. Don't even get me started on the tights. I love dressing my girls. the old look very familiar! These are vibrantly stylin'. Thanks granny indeed. Those shoes and tights together rock! Oh, the pink! Good thing Monkey isn't here to see it or I would have some 'splaining to do about the distinct comparative lack of pink in her shoe selection. geesh, they are all teh cute! it seems like only yesterday that daughter was wearing stuff like that. now she wears black sneakers and hiking boots [and the occasional high heels with rhinestones and/or straps].